"Your life is in danger, consider yourself dead now..." This was the subject heading of the email that was delivered to Seniorsaloud email inbox last night. The contents were alarming (see below in blue) and would have given the recipient a sleepless night had it been a genuine letter. 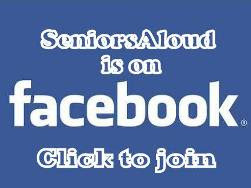 Seniorsaloud has posted several scam letters on this blog before (see links below) as well as samples of phishing. 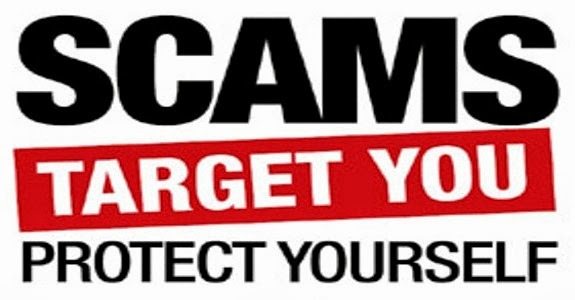 Despite all the warnings about online scams, there will always be some folks who will end up losing their hard-earned savings to these unscrupulous con men and women who comb the net looking for gullible victims. Retirees, in particular, cannot afford to be swindled of their life savings. So take heed. NEVER respond to any email that asks you for money or for your personal data. No 'friend' would ever ask for money to be sent to them, and no bank or organization would ask you to divulge your account number or password online. Look out especially for emails that contain plenty of spelling and grammar errors - a sure giveaway that the emails are fakes. The majority of scams target our feelings of sympathy (asking for money to help someone in distress), greed (notifying us that we have just won or inherited $1 million), and implicit trust in those in authority (requesting for our personal particulars). 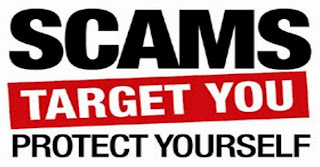 The latest type of scams, however, is aimed at causing fear in us. Please read the scam email below so you'll know what to do if you ever receive a similar email - IGNORE IT. You have been betrayed!!! It's a pity that this how your life is going to come to an end as your death had already been paid for by someone who is very close to you from all investigations. According to the report I gets, you seem to be innocent about what you have been accuse but I have no business with that, so that's why am contacting you to know if truly you are innocent and how much you value your life. 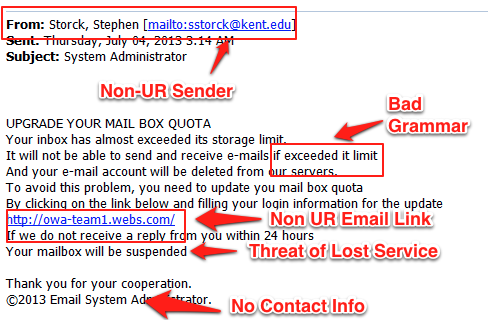 Get back to me if you sure want to live on, ignore this mail only if you feel it's a joke or just a threat. Don't forget your days on earth are numbered, so you have the chance to live if only you will comply with me. I will give you every detail of where to be and how to take any actions be it legal or illegal, that's only when I read from you. You need to stay calm and act unaware of this situation and follow instructions because any move you make that is suspicious; you will DIE as your days are numbered. The New Zealand government's Consumer Affairs Division has just published (June 2013) A Guide for Seniors to help them get online savvy. 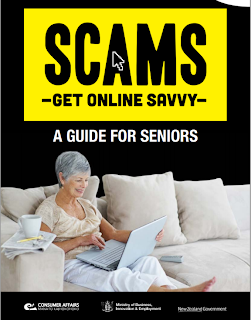 It contains excellent advice on how to protect themselves and their families against online scams. You can download it for free. Please read these related posts too, and be informed. WHO SAYS WE SHOULD DRESS OUR AGE? 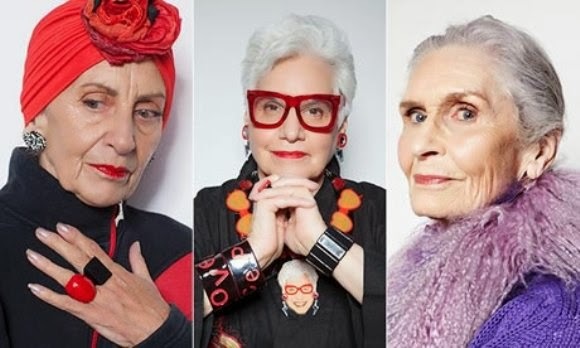 Channel 4 recently premiered a documentary "Fabulous Fashionistas" that follows the lives of six very stylish women with an average age of 80. While many would find their sartorial taste outlandish for their age, few would deny their courage in breaking long-held code of dressing for older women. Conventional fashion rules say that if we are past our prime, we should dress modestly and conservatively. Good tastes dictate that we should not reveal too much of our wrinkled skin and sagging breasts. Loud bright colours draw unwanted attention, so our wardrobe should consist of shades of grey, brown and black. As for hair, it is best to keep it short. Long hair if allowed to hang loose will only lend weight to the face, and add to the long list of body parts that are heading south. 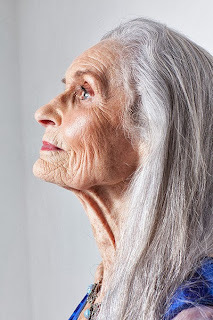 Long grey hair may also get you mistaken for a witch or an escapee from the nut house. Well, these six style-blazers don't give a hoot to what others say or think about their fashion sense. They have made dressing up into an art form, and are enjoying every minute of it. Meet these fashionistas. You can read more about them here. (All photos from Channel 4). 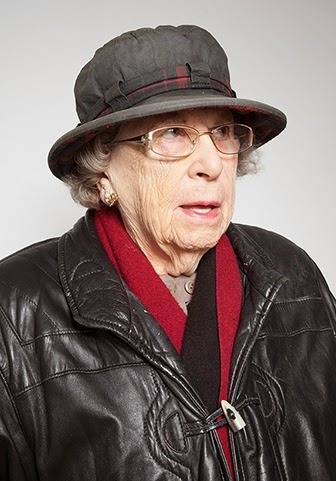 Above:Jean Woods was formerly Gap's oldest employee at 70. Now 75, she works at a boutique. 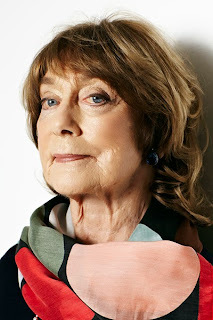 Below: Lady Trumpington, 91, and Gillian Lynne, 87. 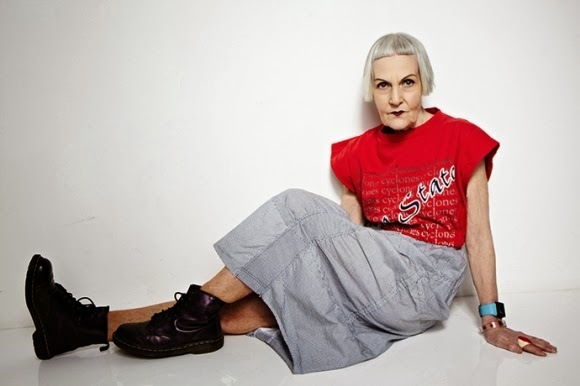 If you are a fashionista wannabe, do check out this fashion blog for older women at Advanced Style. I stumbled upon it while googling 'Fashion styles for older women' after a trip to Germany in 2009. I was so taken by how trendy older European women were. They had such impeccable taste in clothes and shoes, well, at least those I saw in the city streets. Anyway, this blog was started by Ari Seth Cohen who writes in his profile that he "roams the streets of New York looking for the most stylish and creative older folks. Respect your elders and let these ladies and gents teach you a thing or two about living life to the fullest." 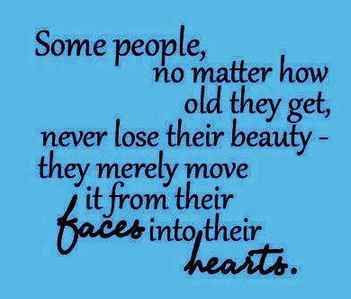 That's one of the best things about growing older. There is no need to impress anyone or please anyone. Today's active, independent women who are in their 70s and 80s enjoy a new self-confidence. They know what they want, they know what makes them happy, and they go for it! We have our very own inspiring fashionista in Suzanne from Penang. 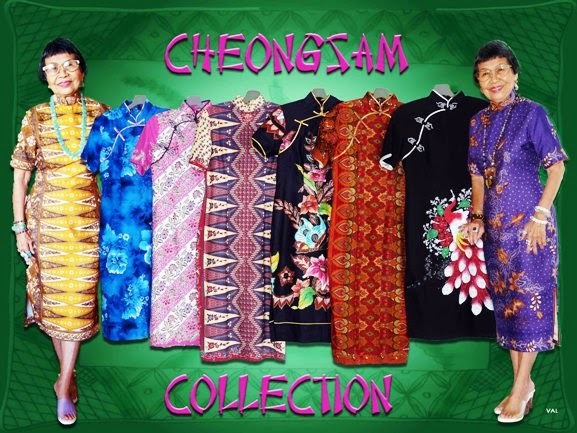 Suzanne, 89, has an entire collection of batik cheongsams. With just a needle and thread, and some beads, she cleverly turns humdrum clothes into designer haute couture that she models for her blog at SuzanneTony. With her husband, Tony, 90, the couple gets my vote for The Best Dressed and Coolest Couple in Malaysia! The last time I was up on Penang Hill was in 1971. I remember the ride up on the funicular train was slow and jerky. But the spectacular view was worth all the heart-stopping moments as the old train creaked precariously up the steep slope. Now one can make the same ascent in the safety and comfort of an electric air-con train in just seven minutes. 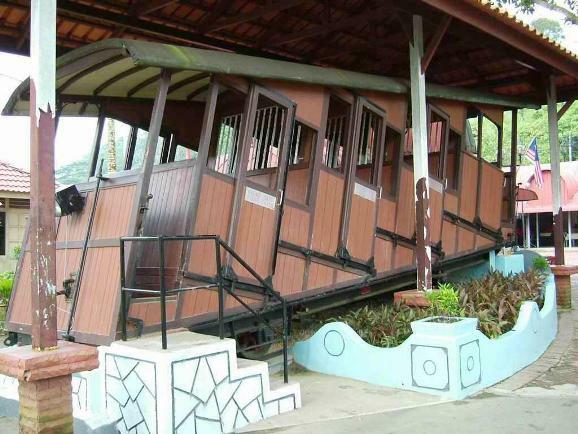 Senior citizens get a 50% discount, and pay only RM4 for a round trip. If you are expecting to see lots of tourist attractions on the hill, forget it. 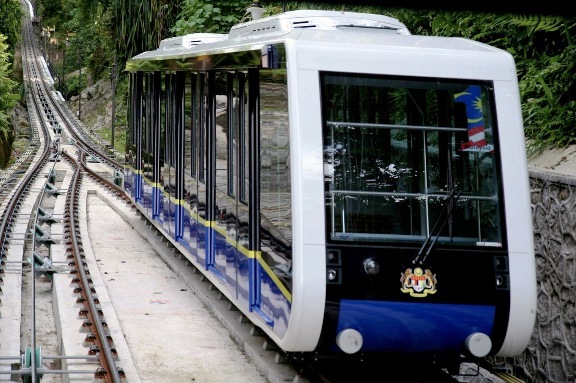 But if you are a nature lover or looking for some peace and solitude, Penang Hill is the perfect getaway for a restful weekend. Looking out from the balcony of our bungalow. There used to be a statue atop the stone pedestal. My girlfriends and I did just that recently. We booked our accommodation at one of the old colonial era bungalows on Penang Hill. We didn't know much about the place except that it was built in 1888 by some Catholic brothers as a place of worship. None of us had ever stayed in a place this ancient, and we thought it would be quite an adventure. Front view of the bungalow, with the chapel on the left. As the place is used mainly for religious retreats, the facilities are basic and spartan, but clean and comfortable enough. Meals are home cooked by the caretaker's wife. 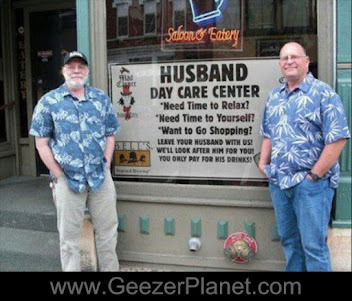 The couple has been looking after the place for the past 22 years, and they have plenty of interesting stories to tell. Another view from the bungalow. There are several similar colonial bungalows dotting the slopes. 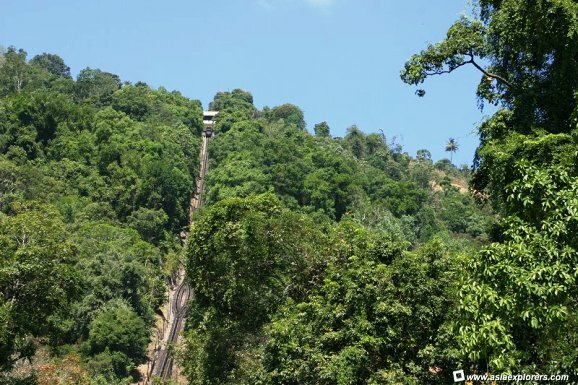 If you love old places, and if you enjoy nature walks, you would definitely want to plan for a short stay on Penang Hill. Here are some photos to share. I love this flight of stone steps leading down to the bungalow. We were rained in on Day 2. On Day 3, we were greeted not only with a burst of sunshine, but also a rainbow of colours, from the purest of white to the brightest of yellow. The garden became a paradise for those of us with cameras. I have never seen so many types of leaves and shades of green as I did on Penang Hill. Passion fruit but not quite ready for plucking. Fruits, like these berries, grow well in the cool hill weather. These are not Malaysian grapes! The rich variety of flora in the garden is simply amazing. Purple bougainvillea. If you love photographing flowers, you will be clicking away in rapture! I had to make do with my small digital camera. A little over-exposed. but the freshness after the rain is evident. Can easily pass for daffodils to the ignorant like me! 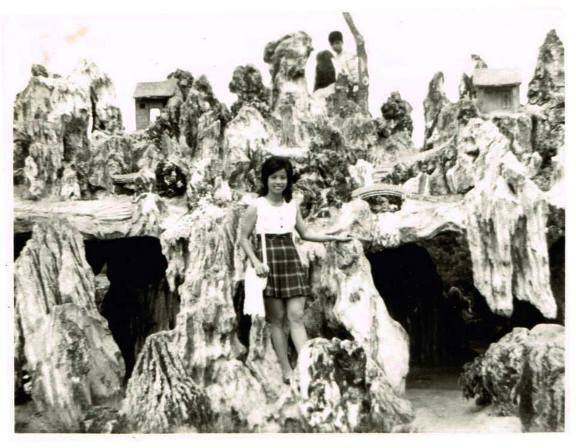 If you know the names of all the flowers and plants in the photos, please help me identify them. Thanks! Nothing beats the natural fragrance of uncut flowers. Not sure if these are red flowers or red leaves! Just one of many species of orchids in the garden. This used to be the canopy walk. Now it's closed to the public for safety reasons. As we were leaving, a mist slowly enveloped the hill rendering further photography pointless. 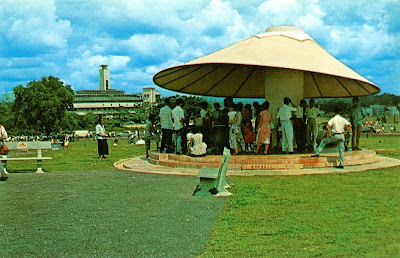 The older ones among us who lived in Kuala Lumpur in the 1960s and 70s will remember Merdeka Park (Independence Park). It was the only park we had in the city then that was centrally located and easily accessible to all. The elderly would gather there in the early mornings for tai-chi sessions, parents would take their children there to play, and young courting couples would enjoy romantic strolls there in the evenings. 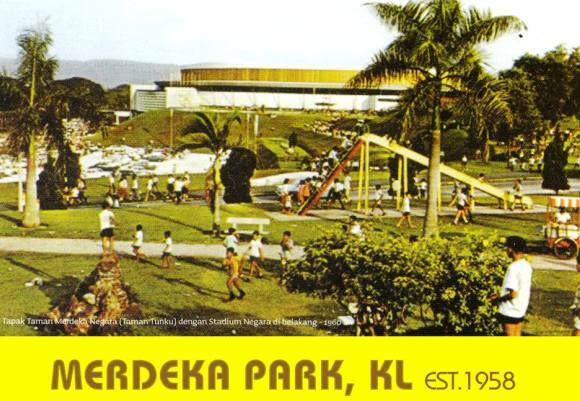 Merdeka Park was a much-loved public landmark along with other landmarks in the vicinity like Merdeka Stadium, Stadium Negara, Chin Woo Stadium and Victoria Institution. 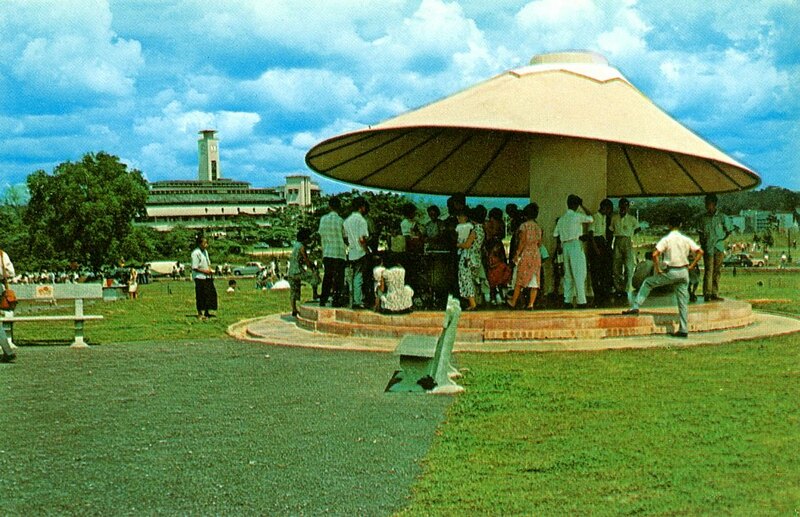 Visitors to the area today will no longer see Merdeka Park with the famous Mushroom where people could take shelter from the hot sun or heavy rain. Gone too are the sundial and the rock sculpture which were popular backdrops for countless photos. The area once occupied by Merdeka Park is now the site of the proposed 118-storey Menara Warisan. 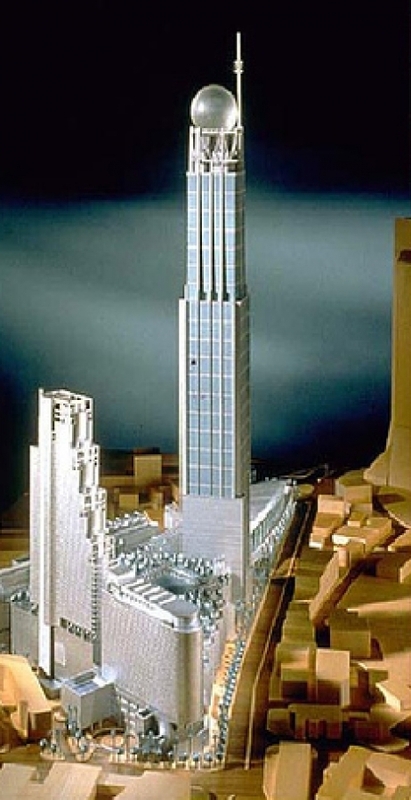 As if the city didn't already have enough skyscrapers! Currently the tallest building we have in the country is the 88-storey Petronas Twin Towers, which are far from fully occupied. Why in the blazes would the government approve the construction of a monstrosity like Menara Warisan which is likely to turn into another white elephant? Warisan means 'heritage'. 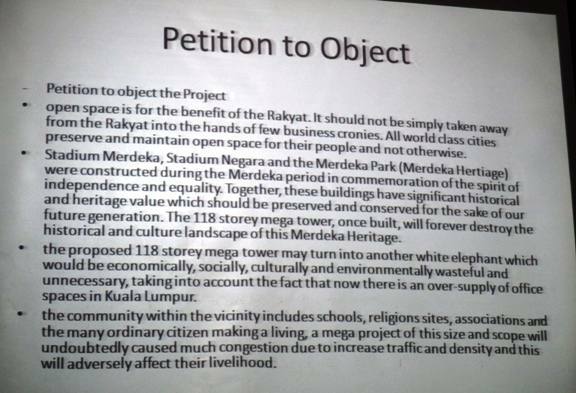 Yet how ironic it is to demolish a true heritage that is Merdeka Park, built a year after the country gained independence, and replace it with a gleaming new tower that has no historical background to boast of. How would this building benefit the people? Or is it meant to enrich only corporate bigwigs and those with political connections? I recently attended a people's dialogue session at KLSCAH. 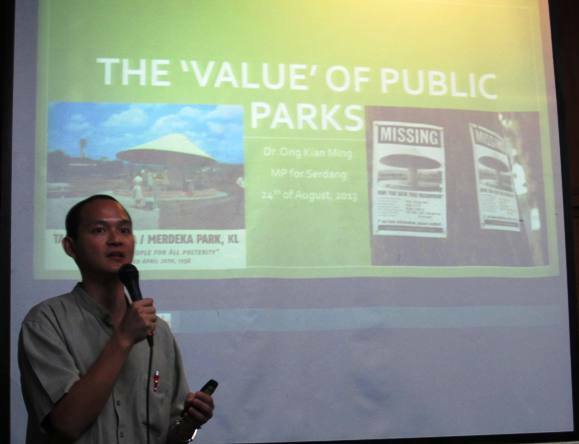 Speakers included heritage conservationist Teoh Chee Keong, and MP for Serdang, Dr. Ong Kian Ming. Both spoke on why we must protect our public space, and preserve our national historical heritage. 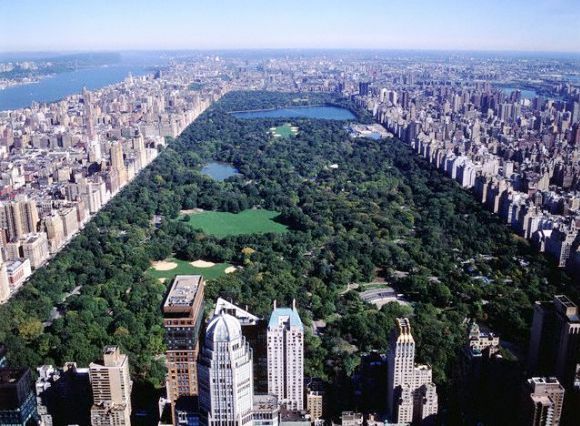 I particularly liked Dr Ong's proposal that if Merdeka Park were to be re-developed, it should be turned into an even bigger and better park similar to Central Park of New York. 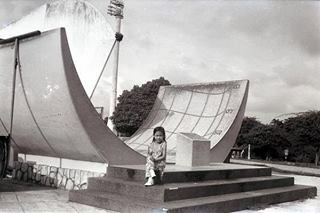 It would be a park with facilities for everyone to enjoy. 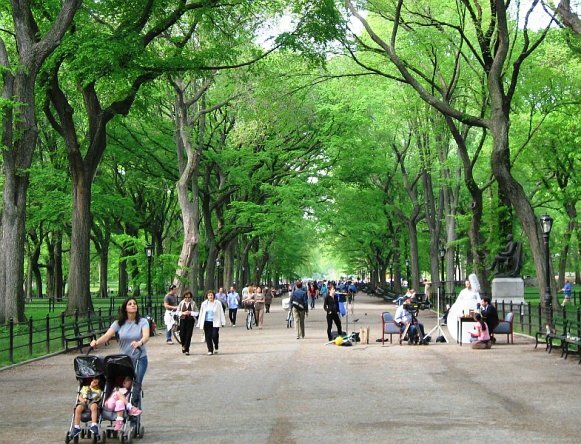 It would be the city's premier green lung. That is exactly what India is planning to do in New Delhi - 'create a mammoth iconic park that would rival New York's Central Park as a refuge from urban chaos'. How far-sighted are Delhi's urban planners, and how utterly lacking in vision are our city planners! What Kuala Lumpur really needs is another park. KLCC Park is not a people-friendly park. It has too many rules and regulations, and limited facilities. Where is Badan Warisan when its help is needed most? It used to be quite vocal about preserving historical landmarks. A check at their website shows that the site is under construction. Their Facebook page is not regularly updated, and their focus seems to be more about general education and awareness than making a stand on heritage buildings that are at risk. 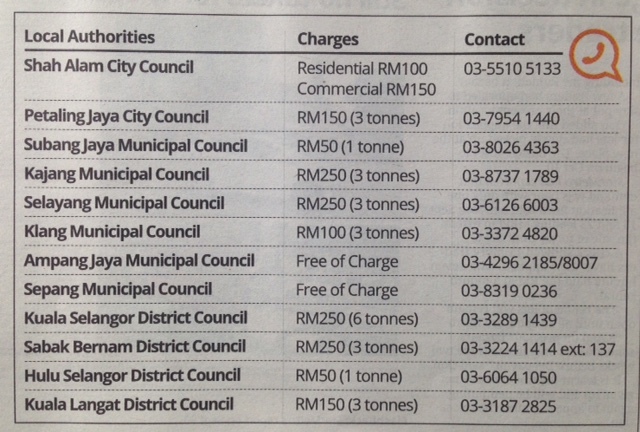 There is no reference at all to the Menara Warisan project. It is obvious they don't want to get involved in any controversial issue that may pit them against the authorities. It's up to us ordinary concerned citizens to voice our views and be heard. The pessimists among us will sigh, shake their heads and say 'What's the use? We are no match against the bulldozers that will be sent in sooner or later. Our pockets are too small to fight the big fat wallets of the powerful GLCs." I would say to these pessimists, if our Bapa Malaysia had thought for even a second that it would be pointless to seek independence from our colonial masters, that they would never surrender one of their prized colonies, Malaysia might still be under British rule today. Fortunately for us, Bapa Malaysia never lost hope. If we don't keep a watchful eye on our national heritage buildings, don't be surprised to see them disappear one by one in the near future, beginning with Stadium Merdeka, followed by Stadium Negara, then Museum Negara, Parliament House, and other independence era buildings. One day there will be no traces left of Tunku Abdul Rahman Putra Al-Haj's legacy as far as historical buildings go, except in our grandchildren's history textbooks and in old photographs in the museum. My daily routine is set. I wake up, clear my email, read the newspapers, do my exercises and have lunch. After that, I go to my office at the Istana, clear more papers and write articles or speeches. In the afternoons and evenings, I sometimes have interviews scheduled with journalists, after which I may spend an hour or two with my Chinese teachers. I have made it a habit to exercise daily. At the age of 89, I can sit up and I do not need a walking stick. When I was in my 30s, I was fond of smoking and drinking beer. I quit smoking because it was causing me to lose my voice at election campaigns. That was before medical research linked smoking to lung and throat cancer, among other things. Oddly enough, I later became hyper-allergic to smoke. The drinking gave me a beer belly and it was showing up in pictures appearing in the press. I began to play more golf to keep fit, but later on turned to running and swimming, which took me less time to achieve the same amount of aerobic exercise. Now, I walk on the treadmill three times a day ---12 minutes in the morning, 15 minutes after lunch and 15 minutes after dinner. Before dinner, I used to swim for 20 to 25 minutes. Without that, I would not be in my present condition physically. It is a discipline. I continue to make appointments to meet people. You must meet people, because you must have human contact if you want to broaden your perspective. Besides people in Singapore, I meet those from Malaysia, Indonesia, and, from time to time, China, Europe and the United States. I try not to meet only old friends or political leaders, but people from a variety of fields, such as academics, businessmen, journalists and ordinary people. I have cut down on my overseas trips significantly, because of the jetlag, especially when travelling to the US. Until 2012, I was still travelling to Japan once a year to speak at the Future of Asia Conference --- now into its 19th year, organised by the Japanese media corporation, Nihon Keizai Shimbun (Nikkei). For a time, I was going to China nearly once a year, although I am reluctant to go to Beijing now because of the pollution. But the leaders are there, so you have to go there to meet them. The JP Morgan International Council, which I am on, did me the honour of holding its 2012 annual meeting in Singapore, so did the Total Advisory Board. Going to France is all right. It is a 12-hour direct flight on an Airbus 380, there and back. But to go to New York is much more tiring --- especially because of the time change, from night into day and day into night. Travelling overseas helps me widen my horizons. I see how other countries are developing. No country or city stays static. I have seen London and Paris change, over and over again. Being out of government means I am less well-informed of what is going on and the pressures for change. I therefore go by the decisions of the ministers, by and large. I seldom express a contrary opinion --- at least, much less than when I was in government and attended Cabinet meetings, which allowed me to participate fully in the debates. Occasionally, when I disagree strongly with something, I make my views known to the Prime Minister. There was an instance of this when the government was looking to reintroduce Chinese dialect programmes on free-to-air channels. A suggestion was made: "Mandarin is well-established among the population now. Let us go back to dialects so the old can enjoy dramas:" I objected, pointing out that I had, as prime minister, paid a heavy price getting the dialect programmes suppressed and encouraging people to speak Mandarin. So why backtrack? I had antagonised an entire generation of Chinese, who found their favourite dialect programmes cut off. There was one very good narrator of stories called Lee Dai Sor on Rediffusion, and we just switched off his show. Why should I allow Cantonese or Hokkien to infect the next generation? If you bring it back, you will find portions of the older generation beginning to speak in dialects to their children and grandchildren. It will creep back, slowly but surely. Every country needs one language that everybody understands. It was a difficult enough task integrating the four language streams the British left us with. The Chinese schools, where the majority of Chinese students were enrolled, were proud of their language, especially with the rise of a new Communist China from 1949. 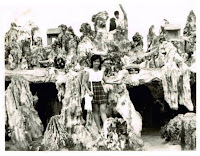 I had to fight on many fronts to make English the language of all schools and the mother tongues the second language. Chinese language chauvinists battled against this policy tooth and nail. The Chinese newspapermen and schools wanted to prop up their student and readership numbers. Because my command of Chinese then was inadequate, Li Vei Chen, my Chinese press secretary at the time, kept the Chinese press, Chinese middle schools as well as Nanyang University and their staff and supporters under tight control to minimise or prevent demonstrations, go-slows and strikes. Eventually, it was the market value of an education in English that settled the problem. Hence, we have today's Singapore, with English connecting us to the world and attracting the multinational corporations, and the mother tongues as second language keeping us linked to C'hina, India and Indonesia. This was a critical turning point. Had the people chosen the other path, Singapore would be a backwater. For sentimental reasons and practical reasons of trade and business with China, we need Chinese as a second language. But we certainly do not need the dialects. To undo now what we had spent so much time, energy and political capital achieving --- the removal of' dialects from the mass media---would be very foolish. Life is better than death. But death comes eventually to everyone. It is something which many in their prime may prefer not to think about. But at 89, I see no point in avoiding the question. What concerns me is: How do I go? Will the end come swiftly, with a stroke in one of the coronary arteries? Or will it be a stroke in the mind that lays me out in bed for months, semi-comatose? Of the two, I prefer the quick one. Some time back, I had an Advanced Medical Directive (AMD)) done which says that if I have to be fed by a tube, and it is unlikely that I would ever be able to recover and walk about, my doctors are to remove the tube and allow me to make a quick exit. I had it signed by a lawyer friend and a doctor. If you do not sign one, they do everything possible to prevent the inevitable. I have seen this in so many cases. My brother-in-law on my wife’s side, Yong Nyuk Lin, had a tube. He was at home, and his wife was lying in bed, also in a poor shape. His mind was becoming blank. He is dead now. But they kept him going for a few years. What is the point of that? Quite often, the doctors and relatives of the patient believe they should keep life going. I do not agree. There is an end to everything and I want mine to come as quickly and painlessly as possible, not with me incapacitated, half in coma in bed and with a tube going into my nostrils and down to my stomach. In such cases, one is little more than a body. I am not given to making sense out of life --- or coming up with some grand narrative on it ---other than to measure it by what you think you want to do in life. As for me, I have done what I had wanted to, to the best of my ability. I am satisfied. Different societies have different philosophical explanations for life and the hereafter. If you go to America, you will find fervent Christians, especially in the conservative Bible Belt covering much of the country's south. In China, despite decades of Maoist and Marxist indoctrination, ancestral worship and other traditional Buddhist or Taoist-based religious practices are commonplace. In India, belief in reincarnation is widespread. I wouldn't call myself an atheist. I neither deny nor accept that there is a God. The universe, they say, came out of the Big Bang. But human beings on this earth have developed over the last 20,000 years into thinking beings, and are able to see beyond themselves and think about themselves. Is that a result of Darwinian evolution? Or is it God? I do not know. So I do not laugh at people who believe in God. But I do not necessarily believe in God -- nor deny that there could be one. I had a very close friend, Hon Sui Sen, who was a devout Roman Catholic. When he was dying, the priest was there next to him. At 68, he was young, but he was also absolutely fearless. As a Roman Catholic, he believed that he would meet his wife in the hereafter. I wish I can meet my wife in the hereafter, but I don't think I will. I just cease to exist just as she has ceased to exist---otherwise the other world would be overpopulated. Is heaven such a large and limitless space that you can keep all the peoples of the world over the thousands of years past? I have a large question mark on that. But Sui Sen believed that and it gave him a certain tranquillity of mind as he went through his last moments with his priest. His wife, who died in November 2012, believed they would meet again. Those around me who may have tried to proselytise to me no longer do so because they know it is a hopeless case. My wife had a friend she knew from school who was very religious and kept trying to convert her. In the end, she stayed away from her friend, saying: "It is absurd. Every time we meet she wants to convert me into a Christian." She did not believe in the afterlife --- although, admittedly, it is comforting if you believe there is an afterlife even if there is none. With every passing day I am physically less energetic and less active. If you ask me to go out in the heat of the sun at two o'clock to meet people, shake hands and kiss babies, I will not be able to do it. I could do it 20, 30 years ago, but not anymore. You take life as it comes, with your physical capabilities declining over the years. Sometimes my secretary would see me resting in my office and would ask me whether they should cancel the next meeting. Sometimes, I would say: "No, let's get on with it." I need 15 minutes for a shut-eye, so that my mind can concentrate after that. But if I cannot, I would say: "Yes, put it off: Let me have a nap." You cannot predict what your physical condition will be like. However rigorous and disciplined I am, it will still be a downhill slide. In the end, my greatest satisfaction in life comes from the fact that I have spent years gathering support, mustering the will to make this place meritocratic, corruption-free and equal for all races --- and that it will endure beyond me, as it has. It was not like that when I took office. The Lim Yew Hock government was already going corrupt. 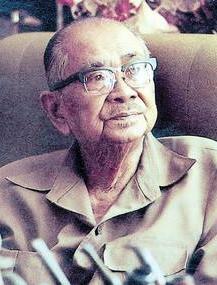 Younger Singaporeans may not be familiar with a man by the name of Mak Pak Shee, a member of that government. He was an Indian Cantonese with a moustache, and he was what you would call a fixer --- somebody who facilitated the fulfilment of favours for a fee. An editorial team from The Straits Times comprising Han Fook Kwang, Elgin Toh, Zuraidah Ibrahim, Chua Mui Hoong and Shashi Jayakumar (an administrative Officer on secondment to the Lee Kuan Yew School of Public Policy) asked the questions below. Q: You have said before that you consider yourself a nominal Buddhist. Would you still describe yourself as such? A: Yes, I would. I go through the motions and the rituals. I am not a Christian. I am not a Taoist. I do not belong to any special sect. Q: When you say "rituals”, what do you mean? A: On set days you've got to give offerings to your ancestors --- food and so on. All that is laid out by the servants. But it will go off after my generation. It is like clearing the graves during Qing Ming. With each passing generation, fewer people go. It is a ritual. Q: Where do you draw your comfort from, if not from religion? A: It is the end of any aches and pains and suffering. So I hope the end will come quickly. At 89, I look at the obituary pages and see very few who have outlived me. And I wonder: How have they lived? How have they died? After long illness? Incapacity? When you are 89 you will think about these things. I would advise that if you do not want to be comatose or half-comatose in bed and fed through a tube, do an AND. Do not intervene to save life. Q: The number of people who do this in Singapore is still very low, for some reason. A: Well, because they don't want to face up to it. Q: Are you in favour of euthanasia, which some countries have legalised? A: I think under certain conditions where it is not used to get rid of old people and it is a personal decision of a man taken rationally to relieve himself from suffering, I would say yes, like the Dutch. So in my AMD, I am in fact saying: "Let me go." Q: If a grandchild of yours comes to you and asks you what a good life is, what do you say to him? A: I have grandchildren in their 20s. They don't ask me what a good life is. They know what it is. There's been a change in the physical world they live in, the people they meet, a change in generations and different objectives to what people do in life. Q: Are you saying that it is not possible to influence young people these days? A: No, you can influence the basic attitudes from the day they are born to about 16 or 17. After that --- sometimes earlier --- they have a mind of their own and they are influenced by what they see around them and by their peers. Q: You spoke about not believing you would meet your wife in the hereafter. Do you not hold out such a hope, even in your quieter moment? Is it not human to do so? A: No, it goes against logic. Supposing we all have a life after death, where is that place? A: So we are ghostly figures? No, I don't think so. Q: How often do you think of' Mrs Lee? A: I have an urn with her ashes and I have told my children to put my ashes next to hers in a columbarium, for sentimental purposes. A: Not really. She's gone. All that is left behind are her ashes. I will be gone and all that will be left behind will be ashes. For reasons of sentiment, well, put them together. But to meet in afterlife? Too good to be true. But the Hindus believe in reincarnation, don't they? Q: It is in the Hindu creed, yes. A: If you lead a good life, you come out in a better shape in the next world. You lead a bad life, you become a dog or something. Q: So do the Buddhists. A: But they are not so sharp in their conceptions of the hereafter. Q: Is your routine these days very different compared to when you were still in Cabinet? A: Of course. The pressure is not there. Q: But you are somebody who has always coped very well with pressure. A: Well, the pressure of office means a decision has to be made. And when several decisions come at the same time, you've got to look at the questions carefully and decide. Once you have decided, you cannot backtrack. It is a different kind of pressure. Q: Do you miss having that sort of pressure? A: No, no. Why should I miss it? I have done my share. Q: And would you say you miss attending Cabinet meetings, and the opportunity to interact with younger ministers? A: No, I think the time has come for me to move on. 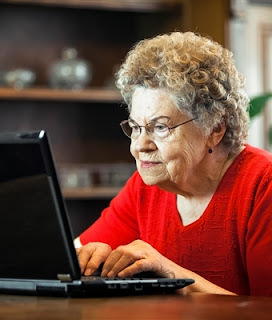 I am 89. Compared to my world and the reference points that I have fixated in my mind, the map of Singapore --- the psychological map of Singapore --- has changed. I used to visit the housing estates. I used to know people from the residents' committees well. I interacted with them. I had a good feel of the ground. Now I do not have that. I have to go by reports, which is not the same thing. So I have to leave it to the people in charge who do go around. Q: Do you regret the decision to step out of government shortly after the 2011 general election? A: No. How can I carry on making decisions when I am losing the energy to make contact with people on the ground? It requires a lot of physical energy. The mental effort does not bother me because I have not had a stroke nor am I going into dementia. But I lack the physical energy. Before this interview, I had a light lunch, did my treadmill routine and then rested for 15 minutes. I did not need that in the past. A: No, I have done what I had wanted to do. I gave up my duties as prime minister to Gob Chok Tong. I helped him. 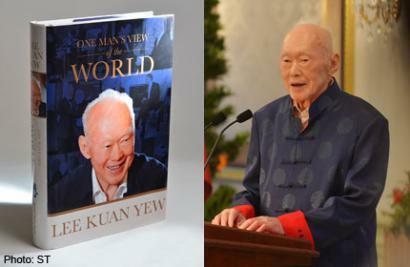 He passed them on to Lee Hsien Loong. It is a different generation now. So my contributions are less meaningful --- except when they want to go back on dialects. Q: How is your health, if I may ask? A: I was recently hospitalised after experiencing what the doctors said was a transient ischaemic attack. But I have since recovered fully and have returned to work. If you take into account the fact that I am in my 90th year... the doctors have told me there is no benchmark for people of that age. Q: You set the benchmark. So you are reasonably happy with your physical and mental state at the moment? A: No, you have to accept the gradual decline in your physical abilities. So far the mental capabilities have not declined, which has happened to some of my friends. I am grateful for that. I think it is largely due to inherited genes. But the physical ageing --- you cannot stop it. Q: Your mental faculties --- could that be due to your mental habits as well? You are someone who has kept himself mentally very occupied and interested in what is happening. A: Yes, of course. And I keep on learning new words and phrases in Chinese, so that I am forced to. It is like playing mahjong. Q: Have your dietary habits changed over the years? A: Well, I no longer eat to my heart's content. I stop before I am full. I also try to eat more vegetables and less protein. Q: At an interview with The Straits Times when you turned 80, you said one worry you had was the narrowing window that people who are ageing tend to have, and that it gets smaller and smaller, that would be the end of existence. Is that something that you still think about --- keeping that window open? A: Yes. Otherwise I would be sitting alone. Why should I meet you and talk to you? Q: Are you afflicted by loneliness sometimes? A: You have to distinguish between loneliness and solitude. I had a friend who was one of the brightest students in Cambridge. He is dead now. His name was Percy Cradock. He had a wife who was Danish and had diabetes. She had lost two legs. Percy used to say: "I enjoy my solitude." And I said: "Get hold of the computer and go on Google. You can get all the poems that you have read and enjoyed, purple passages from works of literature. You just type in the keywords. It will come out.” And he did. Q: What newspapers or Internet sites --- do you read regularly? A: I read The Straits Times and Lianhe Zaobai. I used to read Berita Harian also but now I don't. I used to be very good with my Malay but it is not necessary now that most Malays in Singapore speak English. I follow closely on the Internet news on Singapore, the region, China, Japan, Korea, America, India and Europe. The Middle East --- occasionally. Latin America --- almost zero, because it is not relevant to us. Too far away. Q: What particular Internet sites? A: Google. I prearrange for news from the various regions to be automatically passed on. Q: What books or movies have you read or watched recently? A: I do not watch movies. A: Usually I read biographies of interesting people. I am not attracted to novels --- make-believe, or recreations of what people think life should be. Q: Any recent one that you enjoyed particularly? A: One on Charles de Gaulle. France was lost. He was a nobody. He went to London and said: "I am France." And he went to Algiers and told Alphonse Juin, who had obeyed the Vichy government and was in charge there: "As a Marshal of France, you ought to be ashamed of yourself." That was a pretty bold man. And he walked back to Paris, of course, with the Allied troops having cleared the way for him. Q: What are your foremost preoccupations these days? What are the things that keep you awake? A: I think our changing population. With an overall fertility rate of 1.2 --- we have no choice but to take in migrants. It is difficult to get Singaporeans to change their mindsets. The women are educated. They want a different lifestyle, not to be stuck with early marriages and children. They want to travel first, see the world, enjoy life and marry later, by which time they will have trouble having children. Q: Any hopes for Singapore?